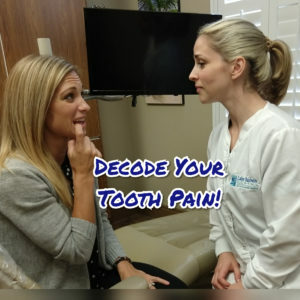 Whenever a patient comes into the office complaining of tooth pain, we always start off with a discussion to try and pin down possible causes. Because let me tell you, it’s surprising how many completely different potential triggers there are for painful teeth. From the wrong toothpaste to sinus pressure to falling out of a tree ten years ago, the list of causes for tooth pain is nearly endless. Here are a few standard questions and terms we use to differentiate symptoms to help make it easier to describe what you’re feeling. Where is the pain? This one seems obvious, right? Just point to the tooth that’s hurting. Surprisingly, this can be hard to pin down. Sometimes you can’t even tell for sure if you’re feeling a top or bottom tooth. Don’t dismiss discomfort that is not super specific; the fact that the pain is generalized or moves around is just as important for us to know! On the other hand, if you know for sure which tooth is bothering you, try to hone in on the area of the tooth (e.g. top? Side? The top, front, right hand corner?) that hurts as specifically as you can. Again, not all tooth pain will be specific in this way, and that can be equally important info. What triggers the pain? Typically, cold sensitivity is due to products and/or recession. Obviously, this is not always the case, but if your teeth hurt when you sip cold water, the first thing we will usually try is to change your products. (Check out this past post about sensitivity: https://www.lakebaldwindental.com/blog/2015-10-06-what-you-can-do-about-sensitive-teeth) However, if you experience a “zing” with heat or sugar, that’s when we really need to pay attention. Heat sensitivity especially can be a tooth’s cry for help. Don’t ignore it! Pressure or biting sensitivity can indicate anything from a developing crack or a simple “bruise” around the root of your tooth, so it’s typically something you should let us know about. Zing: Sounds cute, but feels anything but. This is a sudden, sharp sensation that may register anywhere from mild discomfort to outright torture. Typically, it will fade quickly (within several seconds). Ache: That low down, nagging, bruise type feeling that just won’t go away. Aching may feel like several teeth all at once, or just one specific tooth. Let us know if you feel a sensation of heat or warmth in the area of the aching, too. Throb: Pulsating pain that usually goes along with aching. Any other descriptors are helpful, too: sharp or dull; lingering or short; constant or random; intense or mild; etc. How long has the pain been going on? If it happens off and on, how long do the cycles last? Do you notice anything else in your body along with episodes of pain (especially allergy flare ups or sinus problems)? Obviously, we hope you never have to experience tooth pain. It’s the worst. It can wake you up from a dead sleep and make it hard to do pretty much anything. If one or more of your teeth are singing at you, you don’t need to wait for your next cleaning to let us know! Give us a call and we can usually squeeze you in for a quick and easy evaluation, if only to put your mind at ease. Usually, we can help get you out of pain quickly and that is definitely a reason to smile, Orlando! Help us help you: knowing how to describe your pain helps us know what’s wrong!